Seller will give you a gift certificate in the amount of 499 RUB for a positive review of the product purchased. 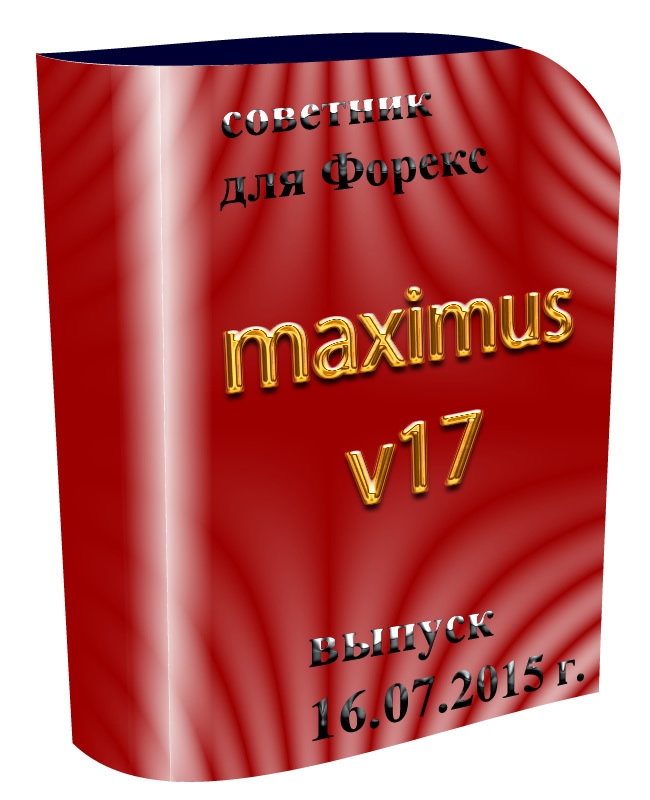 The EA maximus_v17 is used for trading on Forex markets using the platform MetaTrader 4. Important features of this EA include: multi-currency mode (several currency pairs traded from one chart), trading from price consolidations, neural network, automatic optimization and an algorithm for compensating unwieldy deals. Latest update July 16, 2015. The EA detects two price consolidations — above and below the current price. As soon as the price moves out of a price consolidation, there comes an opportunity to open a deal: it may be either a continuing move or a move pulling back. Info about each deal (values of various indicators) is written to a specific file of the neural network. Before it opens a new deal, the EA maximus_v17 checks the current values of indicators against the neural network which plays the role of an adapting filter. The EA tracks all open deals and can make decisions to compensate unwieldy ones, using the profit of other deals for a corresponding period. Automatic optimization is done every day. From a theoretical standpoint, you can add as many currency pairs as you wish for one automatic cycle of optimization. 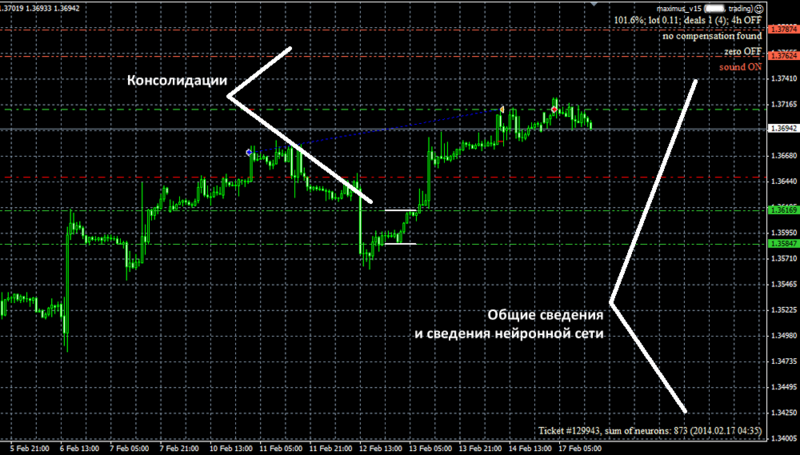 You get sets for AUDUSD, EURUSD, GBPUSD and USDJPY. Sets may be similar. To request new sets follow the link http://mt4.numerika.ru/experts/103/novyy-etap-raboty-s-neyronnymi-setyami-v-sovetnike-maximusv17-v14v15v16.html (Russian but you may also use English). To indicate a lot for trading, you can use either a fixed value or a percentage of available equity. For the latter, you add the percentage sign % at the end. A special function does not allow to open deals for a certain period of time when a gap was drawn over the weekend. It may be important for automatic optimization which is done seamlessly. What is new in the 17th version. The EA maximus_v17 can now draw support and resistance levels on other charts, working all the time on one chart (parameter draw_all). You can now define a relative lot lower than 0.01% (for example, 0.005%). Compensation algorithm has been made more efficient. To post your comments and suggestions, follow the link to the special forum topic http://mt4.numerika.ru/experts/103/novyy-etap-raboty-s-neyronnymi-setyami-v-sovetnike-maximusv17-v14v15v16.html (Russian but you may also use English). You can only use this EA on Windows. Minimal deposit starts from 100 USD (minimal lot should be 0.01 for this case). The EA can handle both usual and extended price quotes (4-digit or 5-digit deposits, or otherwise for other currency pairs). Market Execution and Instant Execution are equally handled. All important data is saved to your local drive, so system failures will not disrupt trading algorithms. You will receive a detailed help file (English version) together with this EA. Your copy of the EA must be licensed for your live account number (you may have another account every 6 months). Demo accounts may trade without a license. You may check the progress of trading of this EA at https://www.myfxbook.com/members/tsinandali/maximus/1618360 Note. Monitoring demonstrates a progress of trading in the past and may not guarantee a successful trading in the future. Trading on Forex bears a high risk of financial losses. The EA is a software that is capable of derutinizing trading on Forex, but it does not guarantee error-free trading decisions and may entail a drawdown. Pirate copies can be easily tracked and blocked. Any act which violates our copyright is traceable and may create a conflict situation. Seller will give you a gift certificate in the amount of 499 RUB for a positive review of the product purchased..